There are still over 14 million Americans out of work, and many families that previously had two incomes are trying to get buy on just one. Meanwhile, the cost of living in the U.S. has risen in the last decade, but real wages have not, further undermining the ability of many to pay daily household expenses. These realities have forced many people to take part-time jobs to supplement household income. "Part-time work has become more of a necessity as Americans become underemployed," Kate Forgach, a consumer specialist at couponsherpa.com, told 24/7 Wall St. "We're even seeing a movement toward benefits for part-timers." 24/7 Wall St. looked at how people are really profiting in the part-time job market. We didn't look at opportunistic options that might work one in a thousand times. Nor is this a list that includes how people can get on use consignment stores to sell their old clothes or put items up for sale on eBay in the hope that someone will buy their old watch or used car. The reality is one in which Americans make ends meet with second, and frequently, third part-time jobs -- usually of the variety that only require a minimum of training and cost employers little to fill. We reviewed the Bureau of Labor Statistics' Career Guide to Industries to identify those with the largest number of part-timers, who also hold full-time positions with other employers. We then reviewed the Bureau's Occupational Employment Statistics to identify the most commonly held part time jobs in each industry. Finally, we used the Career Guide to Industries to identify the average part-time hourly wage for each occupation. 24/7 Wall St. ranked these sectors based on the total number of part-time positions that currently exist. Some of what emerges from the analysis is obvious: Industries like food service and childcare use significant part-time labor, for example. But there are less obvious bastions of part-time employment in newer sectors of the economy. Freelance writers and journalists supply the media with a large fraction of its constant flow of information. Others work part time as marketing copywriters. Not so many years ago, all of these jobs required workers to go to the offices of an advertising agency or a newspaper. Now, they can be done remotely. Technology has provided a universe of work that did not exist in the bricks-and-mortar world just a decade ago. Here's how Americans make money on the side. Most of the people in advertising are on career tracks, but the amount of freelance work is not insignificant. Those jobs are in writing, product promotion and demonstration. There is also a considerable amount of temp work for office clerks and telemarketers. According to the BLS, "with the increasing popularity and worldwide availability of cable television, digital video recorders, computer graphics and editing software, and the Internet, many small and medium-sized independent filmmaking companies have sprung up to fill the growing demand for entertainment content." The rise of independent film and video has allowed for people interested in the industry to engage in freelance production or writing, although the fiscal returns from these positions can be uncertain at best. Also included in this category are part-time movie theater occupations such as ushers, lobby attendants, projectionists, and concessions salespeople. Only 6% of computer systems workers are employed part time, but because it's such a large (and growing) industry, this accounts for more than 87,000 part-time employees. Most of the non-salary positions are commission work, such as setting up websites and networks for small businesses. This kind of freelance work is often done as a side job by people with programming experience. "People familiar with computers can also be a private geek," says Forgach. "There is high demand for computer support, and people can find jobs simply by advertising on Craigslist, for example." Although freelancers have long been a part of the publishing industry, the rise of Internet publishing has done much to increase reliance on these worker. The BLS reports that "the best job opportunities in the future will be for those who have good computer skills and are trained to work in multiple mediums." Most newspapers and magazines now have websites that require frequent updates. Writers and reporters can easily pick up extra work on the side. The same is true for graphic designers. Telephone advertisers and customer sales representatives also have opportunities to work part-time. Although the majority of jobs in the insurance industry are full-time positions, the industry's evolution has created room for part-time work. A growing number of customer service call centers are open 24 hours a day, seven days a week. This requires customer service representatives to be available to answer customers' questions, update policy material, and perform other company duties at all hours. In addition to this, the increase in new technology, and the growth of telephone and Internet sales have opened up the field to those unable to commit to the industry full-time. With many children having two working parents, the demand for part-time childcare has gone through the roof. After-school daycare, nannies and tutors are all positions that require minimal training. While the benefits are poor, child care is one of the few industries with decent growth in today's weak employment environment. These jobs are available for out-of-work teachers, nurses, as well as young adults who cannot find other employment because of the economy. Forgach adds that in the summer, those working in the industry can find jobs at summer camps and child enrichment programs. "There are also opportunities in tutoring the very young," she says. "Many parents want to expand their children's English skills, for example, and those who can provide private ESL tutoring can find part-time jobs in that." The grocery business has one of the largest part-time workforces of any industry. Grocery stores are popular fallback positions for the young and unemployed because the jobs don't require a great deal of formal training. 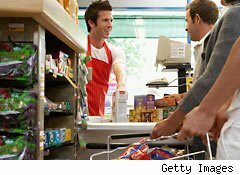 Cashier -- not just at groceries stores -- is the second most common position in the country after retail salesperson, accounting for 2.6%, or 3.34 million jobs, according to the BLS. In a profile of the job, the BLS states: "[grocery store] jobs are particularly attractive to those looking for work with flexible hours. Part-time schedules predominate for most cashiers and counter service workers." Clothing, accessory, and general merchandise stores have an extremely high percentage of part-time workers. This is due in part to the industry's high turnover rate, as well as the large number of inexperienced workers in the field. But this environment has also made the field attractive to those looking to supplement their incomes. The most popular occupation in the industry is retail salesperson, which comprises 40% of the industry. In fact, retail salesperson, including both part and full-time workers, is the most popular occupation in the U.S. Unfortunately, it's not a high-paying position. Although 20% of workers in the health care industry are part-timer, that number spikes to 37% in certain areas, such as dentists' offices. Many health care offices are open at all hours, and therefore require employees 24 hours a day. Due to the need for shift work, many health care professionals, such as nurses, pick up additional part-time jobs to supplement their incomes. Orderlies and health care facility attendants also often work part-time jobs. Forgach says that a different part-time option for "people in the health care industry who clean after people, is to clean homes. They make roughly $25 to $30 an hour, depending on the area, and providing they work directly for the clients, not agencies." There are ample opportunities for part-time work in the food service industry, which includes restaurants and bars. People looking to work extra hours can work as waitstaff, hosts, dining room attendants, fast-food employees or bartenders. The high rate of part-time work facilitates flexibility of hours for employees, making it a highly desirable field for those who need to schedule the work around other jobs.